I have a couple of thermal carafes collecting dust at the back of my pantry. I don’t use them often, but they always make an appearance around the holidays when I’m entertaining and need to have coffee for a group hot and available. I like a carafe that looks attractive, keeps coffee hot for at least 2 hours and will hold almost a full pot of coffee, if not a whole one. Recently, Cook’s Illustrated put some thermal carafes to the test, choosing a variety of stainless steel carafes to compare. 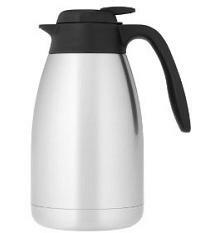 All the models they tested – Avantro Ultimate Server Vacuum Insulated Coffee Carafe, BonJour Julia Thermal Carafe, Krups Brushed Stainless Steel Thermal Carafe, Thermos Nissan Stainless Steel Carafe, West Bend Thermal Carafe, Zojirushi Premium Thermal Carafe – kept coffee above 120F for at least three hours. Their top choice was the the Thermos Nissan Stainless Steel Carafe, which not only met my critera above, but it also passed the CI “tip test” and didn’t leak when knocked over.